With the Dollar roaring higher, the entire commodities complex has come under considerable pressure. In the energy sector, the perceived economic strength of the past few weeks has off-set some of the downward pressure from the Dollar, as a better economy generally translates into higher demand for energy. Crude did not perform all that well leading into the weekend, and that’s a little concerning. 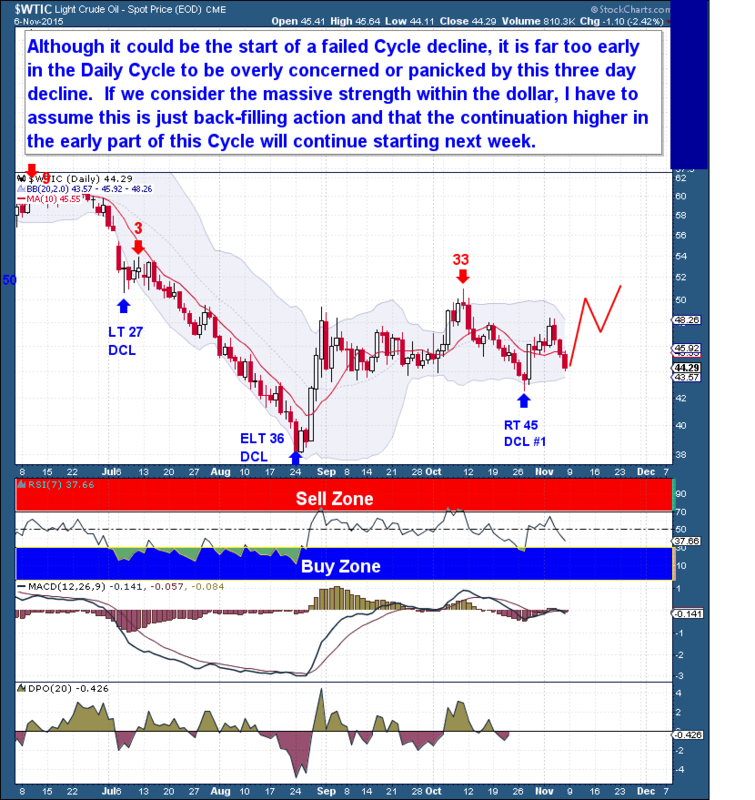 We could speculate that Crude’s weakness is the beginning of a failed Daily Cycle, but at this point it would be analytical overreach – it’s far too early in the Daily Cycle to be concerned about the current three day decline. I prefer to focus on the current price action, including the Dollar’s massive strength. In those terms, it appears that Crude is holding up relatively well. So at this point, I’m inclined to see the current decline as back-filling, and believe that Crude will continue higher next week, driven largely by early Daily Cycle timing.